Want to see e.Mix in action? Click here to view our informational video. 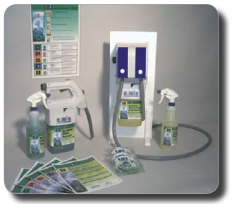 A simple, reliable, economical dilution control system that promotes health, safety, regulatory compliance, and environmental stewardship. It’s the perfect answer for reliable and safe cleaning. The closed-loop, leak resistant system accurately dilutes cleaning concentrates for a variety of applications. The flexible system protects the health and wellness of staff and building occupants by eliminating the exposure to concentrated chemicals as well as potential for accidental mixing of harmful chemicals. Facility manager’s who care about cost control, safety, and the overall appearance of their buildings appreciate the easy to understand e.mix Training Program. A program designed to lower training costs and improve worker safety. 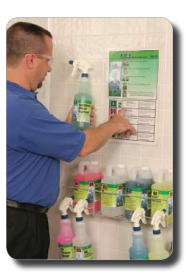 Guarantee the right amount of cleaning solution used with every application. No more worrying about under or over dilution. The e.mix closed-loop system, and sealed containers with a no spill feature reduces employee contact to chemical concentrates – keeping everyone save and healthy. Enable users to fill buckets, automatic scrubbers and RTU quart bottles quickly and easily by using the dual-dilution control tip with high flow and low flow adjustments. 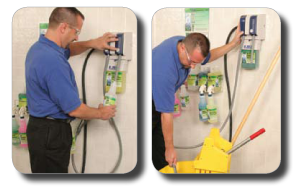 The wall mounted version is compact and space conscious, while the portable unit allows staff to “take dilution control” directly to the job site to speed up the cleaning process. Eliminate the potential for employees to be exposed to concentrated chemicals and/ or accidentally mix harmful chemicals. Accurate dilution control also protects building surfaces; reducing wear and tear on a building. Plus the concentrated packaging reduces waste and is good for the environment. Click here to view our e.Mix Brochure.